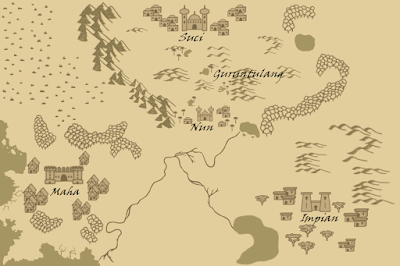 So, talking about geography … I made a map! So there are three city-states in the Trikingdom. Which is a stupid name because I couldn’t think of anything better. Hahaha. Maha—meaning Great—is the strength of the kingdom. This is where the King is based, where he governs from. It’s a lush country with forests and farmlands, and is a more typically western/medieval-European type city. Think grand castles and looming arches, large stonework, and cobblestones—and, further out in the countryside, charming brick cottages. Impian—meaning Dreams—started off as the tech-wonder type city, you know where people chased their dreams. It was meant to be more industrial at the start, but later evolved into something more dreamlike. Because if Maha is the strength of the kingdom, Impian is the heart. It holds the dreamers and the mystics, and is where the Secretkeeper is based, where judgement is often made. Impian is more tropical, with warm, humid weather, hard dirt streets and terrace houses with peeling plaster walls. 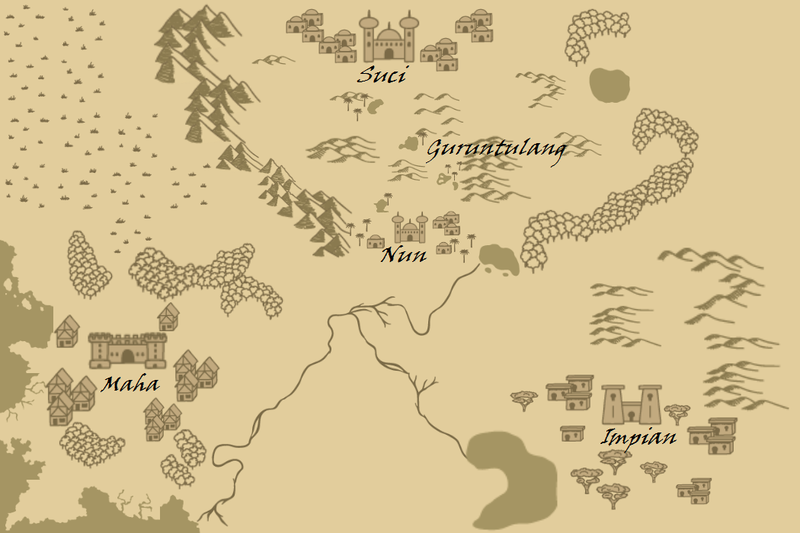 It has jungles and rainstorms, and is a crowded South East Asian type setting. Suci—meaning Holy—is the soul of the kingdom. Life revolves around the Temple and the priests, plus the constant traffic of pilgrims entering and leaving. This is where the High Priest is based, where sacrifices are made. To get to Suci, pilgrims from both Maha and Impian have to pass through Nun, which is the only entryway to the Guruntulang Desert. Then they have to trek through the desert to reach Suci. It’s sandy and dry and very, very brown. I'm terrible with names, too. Have you ever considered calling the whole thing an amalgam of the three city-states? Just a thought. What a pretty map! The kingdom sounds beautiful.